Hak’s BBQ Sauce: A gourmet, gentleman’s BBQ sauce. Sweet and tangy flavors hit first, then caramelized onion and garlic. Finally a smack of bourbon and smoked and roasted chiles round things out. 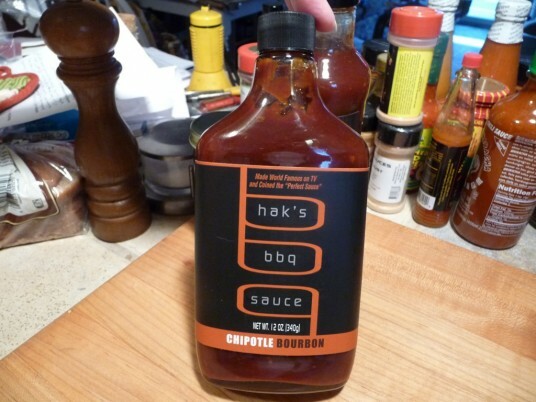 You’ve just had a mouthful of Hak’s Chipotle Bourbon BBQ Sauce! It brought “secret weapon” heat to the competition, earned praise from some of the toughest food critics around and satisfied a room of hungry truckers – and now anyone can take home reality cooking star Sharone Hakman’s smoky, smooth and sophisticated BBQ sauce. Hak’s BBQ Sauce, a premium all-natural sauce line developed by the self-taught Hakman, who was a finalist on the first season of FOX’s hit culinary competition series MasterChef and whose refined sauces were praised throughout the competition, are now available to the public. 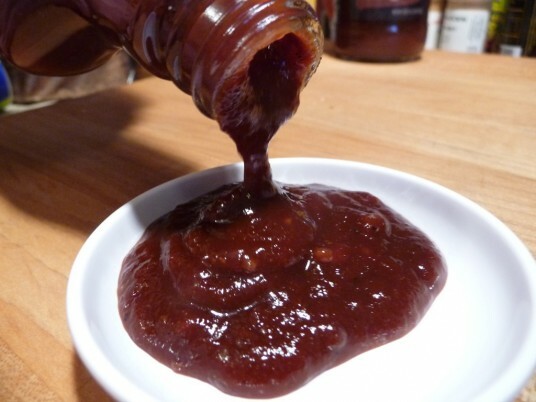 Texture & Appearance: – With a thick, chunky texture and a dark mahogany color, this sauce’s appearance rocks as a small batch / craft made BBQ sauce. There are scattered bits and chunks of veggies and peppers that really make for a big taste in the mouth. Taste Straight Up: – I could eat this out of the spoon. It’s very spicy with a nice sweet smokey heat that is true to the chipotle profile. There is no bourbon whiskey listed in the ingredients, but Hak’s tells me it’s one of the “natural flavors”. 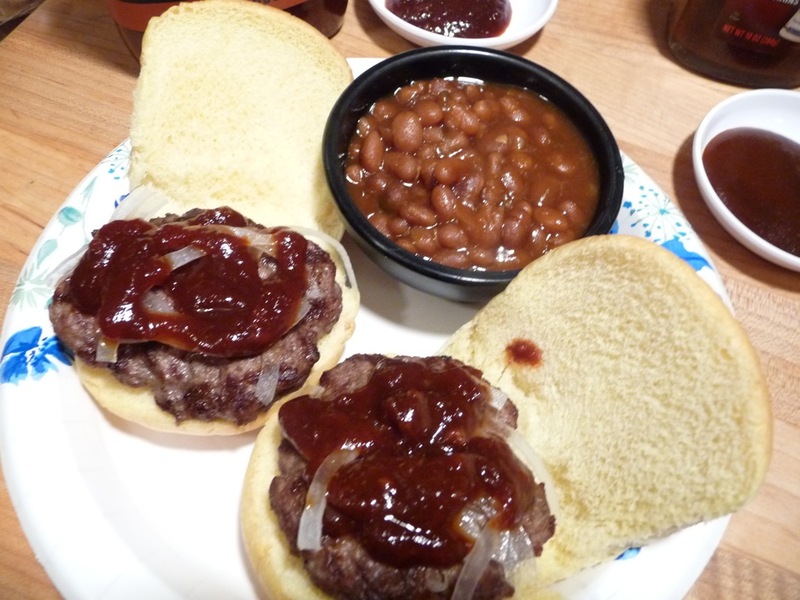 Heat Level: – I’ve said many times on this blog, that I don’t like heat in my BBQ sauce, but I am coming around… with quality blends like Hak’s, I’m learning that some spice and heat in a BBQ sauce can be a good thing. I gave it 4 stars only because the heat level won’t hurt you… it just exists as a supporting player. This is good stuff people! Label/Graphics: – The flask style bottle is a classic, and along with the orange on black graphics, this bottle screams “Classic Gentleman’s Sauce”. If this were BBQ Prohibition times, this is the one everyone would keep in their hip flask… must be the bottle. A true gourmet package all around, this ranks up there with Draper’s BBQ Sauce in terms of complex flavor from simple ingredients, and is an all-around classy product! Overall Rating (Taste on Food, Final Thoughts): – I give it 4 out of 5 stars because I felt it did not work well with ribs – just a bit too spicy. On chicken wings and burgers it rocked. And indeed on burgers, which was the original concept and presentation that won this sauce over with the judges on Master Chef, it worked best. Hak’s BBQ Sauce is a sophisticated line of premium BBQ sauces launched in 2011 by self-taught chef Sharone Hakman. The line was inspired by Hakman’s appearance on FOX’s MasterChef, a cooking competition series for amateur chefs, in which his “secret weapon” sauce scored big. Keep up with the latest news at www.facebook.com/haksbbq. Hak’s BBQ Sauce is available exclusively at www.haksbbq.com and retails for $8 per bottle or $18 for a three-pack; it is also available for restaurant bulk purchase. On the site, visitors can also score great BBQ recipes, serving suggestions and BBQ tips. Go for the three-pack, it’ll cost you just under $10 per bottle shipped, and for a gourmet BBQ sauce that ain’t bad, and it’s so good. Tell them HotSauceDaily.com sent you! Sounds like what you guys said on the last Hot Sauce Weekly podcast is true about gourmet sauces and BBQ sauces in general that are breaking the mold so to speak. Good review! Thanks Kevin. We’ve had a few that craft sauces that “broke the mold” but were too far in left field. This one’s a winner for sure. This one is definitely on my radar to try out. I like how thick the sauce appears. We did a follow up interview with Sharone in July on Imperfect Women. I ordered the sauce for myself and for our Food Editor/Writer, Patty. She made his recipe for ribs and used his sauce and really enjoyed it! I have also used the sauce and my oldest son, who is a BBQ sauce expert ;), has asked me to order more. Also Thank you Brian for the great review. I’m stoked you enjoyed the sauce and happy to get your feedback. I will be launching two more flavors this year and will get them to you as well. They will ROCK! Also I saw the baked beans on the side with the burgers you made. A spoonful of Hak’s in there will do the job as well. I use it in my chili and its a winner. Cheers! and I always say , life is short, EAT IT UP! Thanks Sharone. Two great ideas from the man himself! I will add some of your sauce to our next baked beans. Really looking forward to seeing what you are coming out with next! I did add a tablespoon or so of Hak’s to some baked beans, and it did take them up a notch in flavor. Great idea. Excellent review! I also had a chance to try this sauce. Good stuff! Thanks Big Wayne. What meats have you tried it on? I actually tried it on two different meats — I tried it on smoked sausage (which it didn’t work quite as well on in my opinion — mainly due to the texture), and I actually tried it as a condiment on a rib meat sandwich.